How HireRabbit grew eClerx’s facebook job traffic by 289% with social & mobile recruiting « @HireRabbit Social Recruiting Blog! 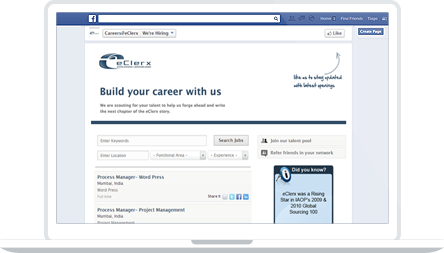 With a dedicated career page on Facebook, eClerx wanted to drive traffic and generate applications for its job openings. eClerx chose Hirerabbit to create consistent brand presence on facebook, promote employer brand and convert fans into applicants. Enhance employer branding and increase positive footprint on the internet. 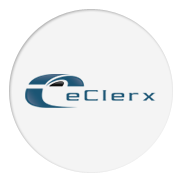 Build traffic and generate applications for eClerx job openings. Grow Facebook fan base and build relationships with candidates. HireRabbit's Facebook and mobile recruiting solution increased job traffic & applications by 289%, making HireRabbit an important channel of recruiting for eClerx. 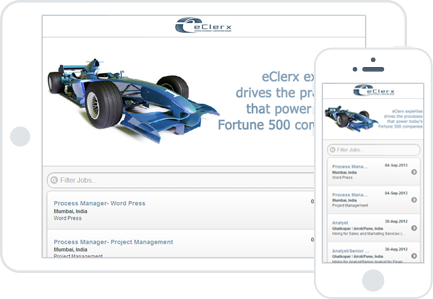 eClerx's facebook & mobile job site generated 8,150 job views, and converted 10.06% of visitors into 820 applications. eClerx's branding site on Facebook generated over 3000+ views. 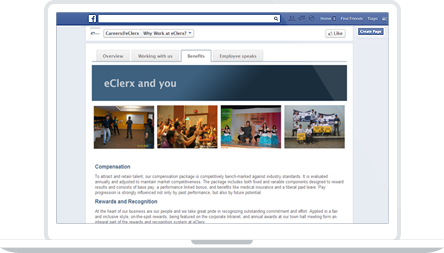 eClerx also doubled its facebook fan base after implementing HireRabbit solutions. Generated hundreds of social actions (like, comment, share) by candidates, about careers and jobs at eClerx. Create a branding site on its facebook fan page and promote company culture among fans. Create a custom brand presence, rich in images to enhance branding and increase engagement. Influence passive candidates by providing them an inside look at the company. Extend career presence on Facebook to promote jobs and simplify the Facebook hiring process. Update fans with latest work opportunities at eClerx and allow them to consume jobs from inside Facebook. 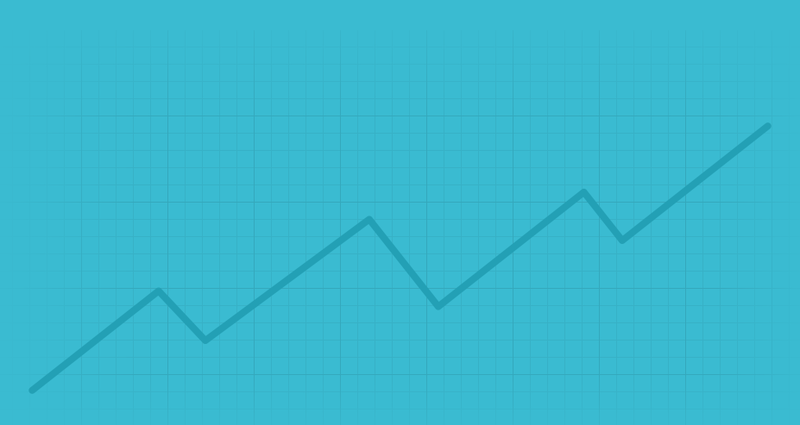 Enable social job sharing for increased reach and fan growth. Create a branded mobile job site which works on all popular smartphones, and tablet devices. Allow candidates to search and save interesting jobs on the move. Integrate mobile with Facebook recruiting to tap in to candidates using Facebook from a mobile device. Gather single unified view of job performance data. 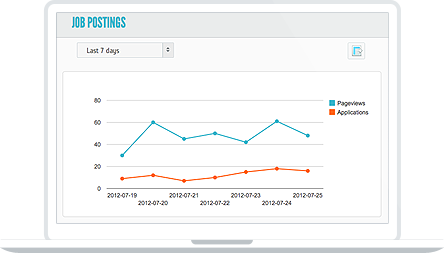 Gain real- time insights into the candidate activity. Understand social media return on investment. eClerx Services Limited (“eClerx”), founded in 2000 and publicly listed on both the Bombay and National Stock Exchanges in India since 2007, is a leading knowledge process outsourcing (“KPO”) company providing middle/back office operations support to over 30 Fortune 500 companies. Headquartered in Mumbai, India, eClerx's five delivery centers across India support a diverse global client base, including the world’s leading Financial Services, Broadband, Cable & Telco, eCommerce & Retail, High Tech, Industrial Manufacturing & Distribution, Software, Media & Entertainment and Travel companies. "HireRabbit is an easy-to use and effective, enterprise class social recruiting system at a fraction of price." Start your risk-free 14 day trial.